Is this the first time this bus route has been in service since the 2010 doomsday cuts? 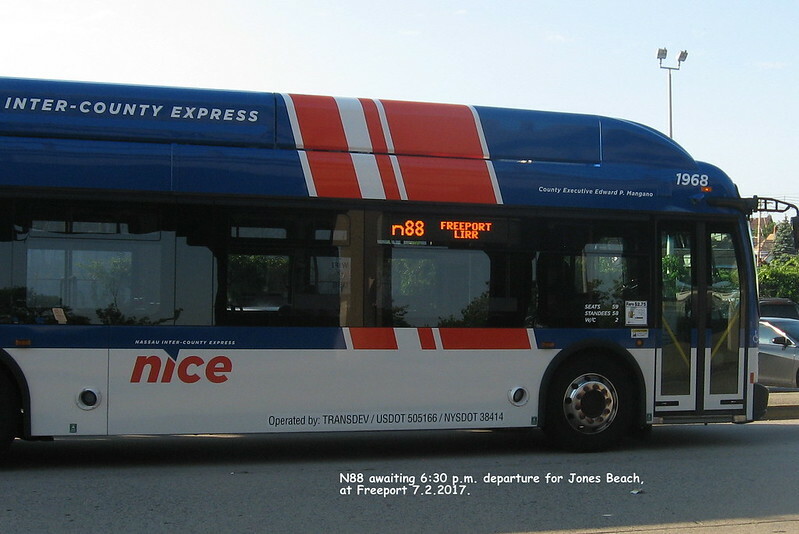 What's the difference between this bus and the N88? NICE ran the n87 last summer I believe. I think the route is basically the same except this summer they are running it to Freeport to help with crowding problem they faced on the n88 last summer. NICE needs some artic buses pronto. Thanks for pointing out the change. 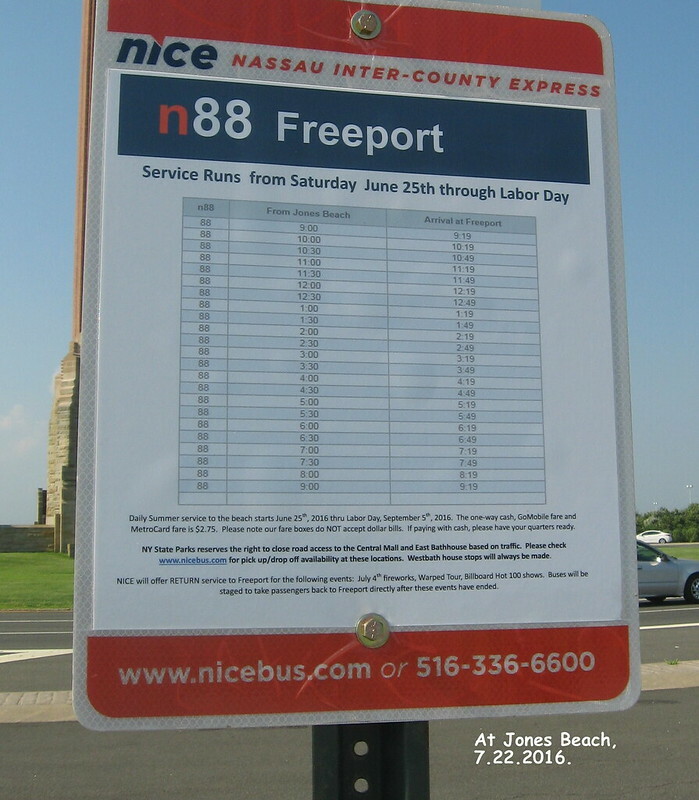 It appears that the north N87 will take 19 minutes to use the Meadowbrook Parkway to reach Freeport station, then run to the Wantagh station in 8 minutes, possibly the first revenue service on Sunrise Highway ever (Freeport-Wantagh, that is). I bet they aren't adding bus stops on that section. 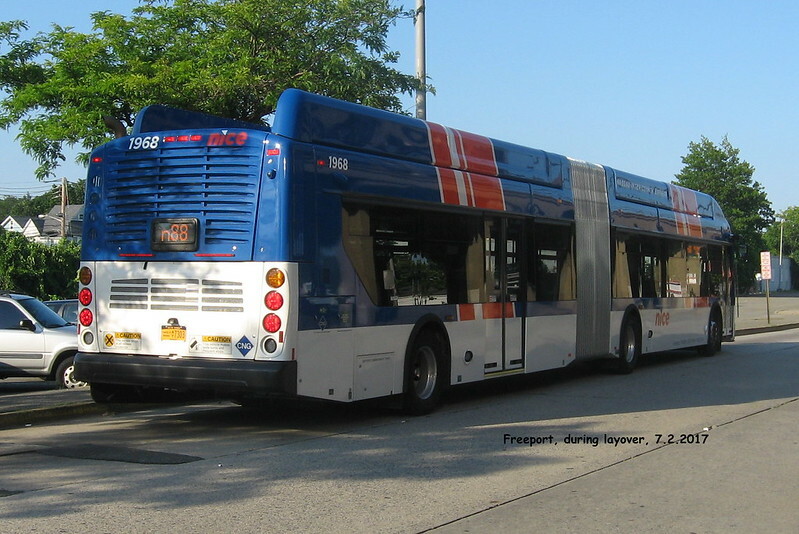 Then north to Hicksville on a route I cannot find on the Nice website. 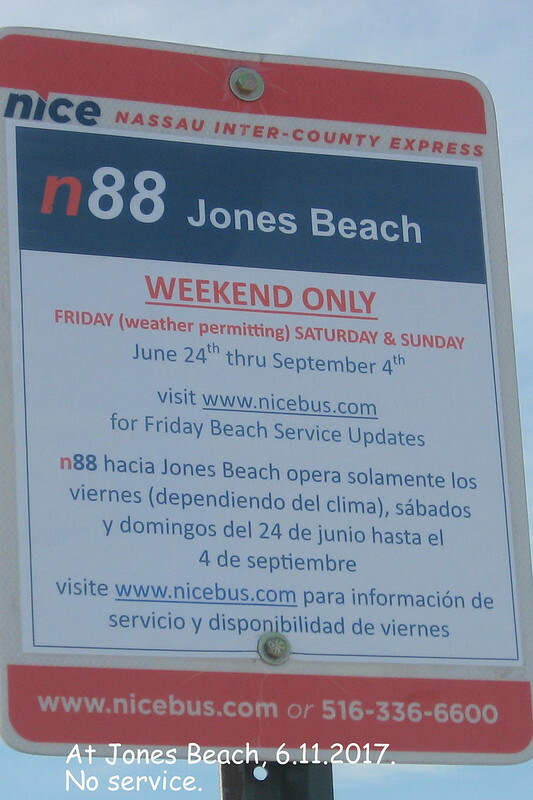 One side-effect is that only two buses leave Jones Beach each hour, even during the 4 p.m.-6 p.m. rush home. The N88 departures used to be in addition to these. 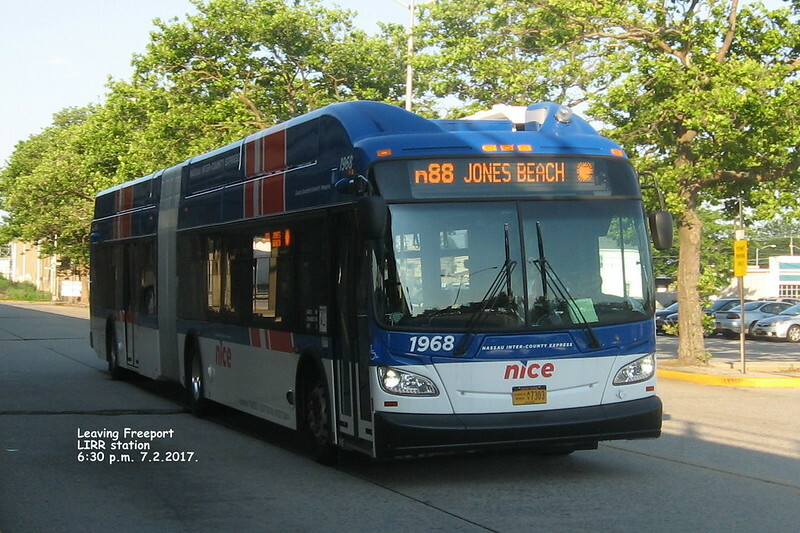 About June 23, 1945, our family got off the LIRR at Wantagh and got a bus to Jones. My parents' 10th wedding anniversary. Anyone know if the next order of buses will be for artics or 40 footers? The schedule is half-hourly even at 5 p.m. However, there was light ridership on this trip on a hot sunny Friday. 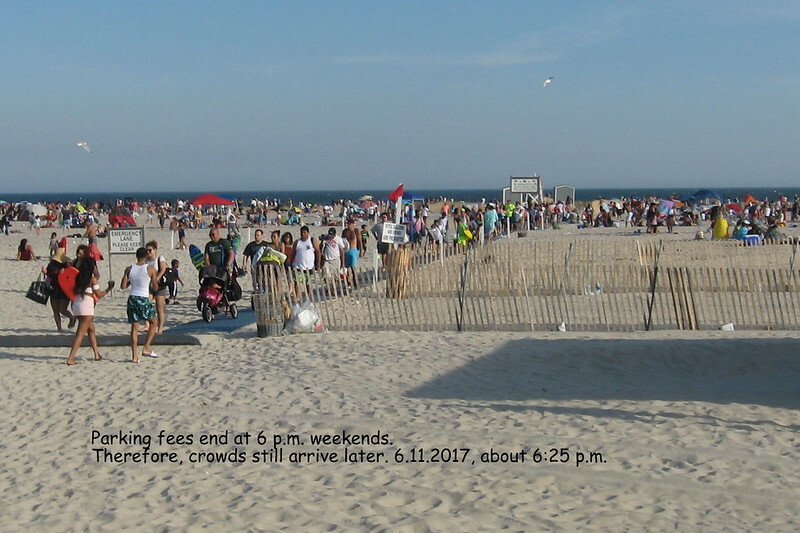 Crowds at the beach, Sunday, June 11, 2017, but this is the NICE sign. 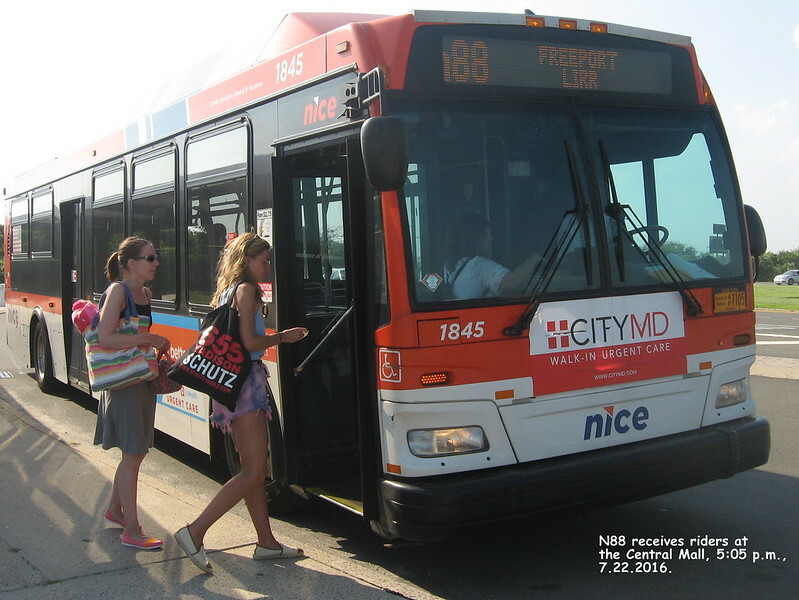 Four passengers boarded the 6:30 p.m. to Jones Beach. Maybe they were cleaners who had a ride home from the beach at the end of the shift. What is this bus make and model? Thanks.